One of the most beloved pop-ups in recent times has been Brian Dunsmoor and Kris Tominaga's Wolf in Sheep's Clothing (unrelated to the recently-defunct restaurant bearing the same name), which bowed at Capri Venice in December 2011 and ran until last summer. As a follow-up to that venture, the duo teamed up with Paligroup's Avi Brosh (a regular at the old spot) to launch The Hart and the Hunter inside a space at Brosh's Palihotel that was once home to a Brendan Collins-run coffee bar. 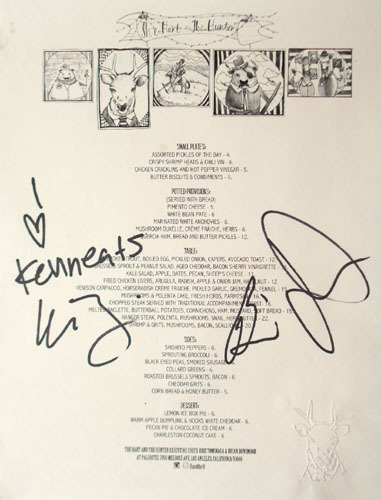 Named after one of Aesop's Fables depicting a narcissistic, skinny-legged deer, the restaurant debuted last October with much of the original staff in place (including GM Jonathan Strader), and features more of the chefs' Cal-Southern cooking. About the Chefs: Georgia native Brian Dunsmoor is an alumnus of the well-regarded Johnson & Wales culinary school in Charleston, where he graduated from in 2004. During his tenure there, he worked at Starfish Grille in the City, and also interned at Kiawah Island Golf Resort's Atlantic Room. Following, Dunsmoor went to Blind Pig Tavern in Athens, and during this period, also attended Gainesville College. In 2005, he began cooking at Hugh Acheson's much-lauded 5 & 10, where he really began developing his skills as a chef, but left two years later to move to LA. Once on the West Coast, Dunsmoor secured a post at Michael Cimarusti's top-notch seafooder Providence at the tail end of 2007, then became sous at both The Hungry Cat and Joe's, before leaving to head up the kitchens at the revamped Axe on Abbot Kinney. Kristopher Tominaga, meanwhile, grew up right here in Southern California, and fell in love with cooking while attending CSU Chico. After graduating with a business degree, he enrolled in the highly selective Culinary Arts certificate program at Boston University. Once school was done, he stayed in Boston for a while and cooked at Frank McClelland's famed L'Espalier, under Chef de Cuisine James Hackney. However, LA beckoned, and Tominaga soon returned, finding employment as a sous chef at Joe's, where he would meet Dunsmoor in 2008. He would eventually become CdC there before leaving to start WiSC. The Hart and the Hunter resides in a building that was once home to a youth hostel called Orbit Hotel, and before that, the Century Home For The Retired & Elderly. Given such limitations, I can't complain too much about the renovations. It's a tiny, homey sort of space, with the requisite communal table and a lilliputian, glass-encased kitchen. Also of note are the mismatched chairs, equestrian-themed knick knacks, as well as the infamous blue-tiled walls, which no doubt contribute to the sometimes-deafening din of the place. 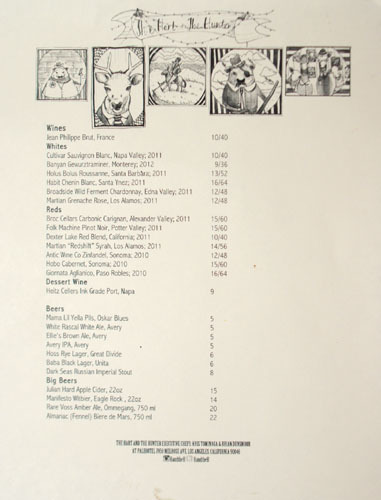 The menu here at Hart and the Hunter reads well, an appealing-sounding array of dishes categorized into a logical progression of various sections. To drink, there's a not-terribly-expensive, California-centric wine list and a pretty good selection of craft beers. BYOB is available with a $15/5 corkage fee for wine/beer, making it one of the few places that rightly distinguishes between the two types of booze. Click for larger versions. 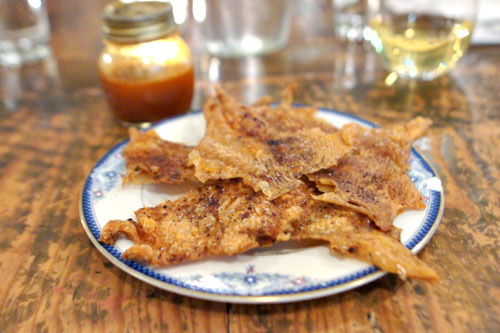 It seems like everyone starts things off with a plate of the cracklins, and for good reason. 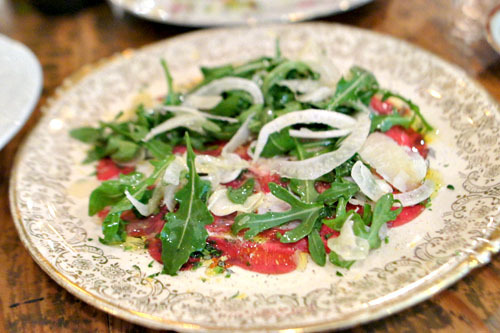 The skin is oft considered the best part of the bird, so why not make it the star of the show? 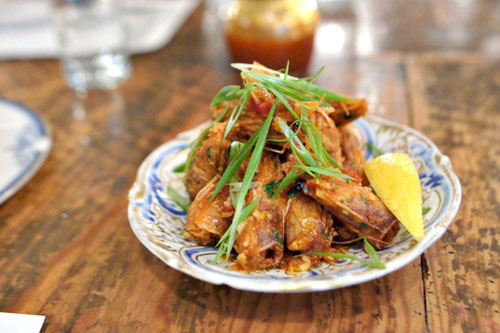 The dish was all that you'd expect: crunchy, salty, savory shards of chicken-y goodness, made even better with a dash of the included hot sauce. Deep fried shrimp heads are a favorite of mine at sushi joints, so again, why not make a whole course out of 'em? Crunchy and briny, the heads paired swimmingly with the heat in the dish, while a hit of lemon was the icing on the cake. Talk about creative reuse. 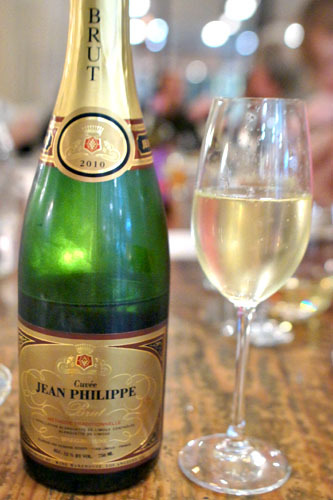 On the beverage front, we commenced with some bubbly, specifically a bottle of the Jean Philippe Brut, France [$40], a Blanquette de Limoux from France's Languedoc region. It was wonderful, with some juicy grape-y and apple-y flavors that managed to convey sweetness without being cloying. Undeniably fun, and utterly gluggable. 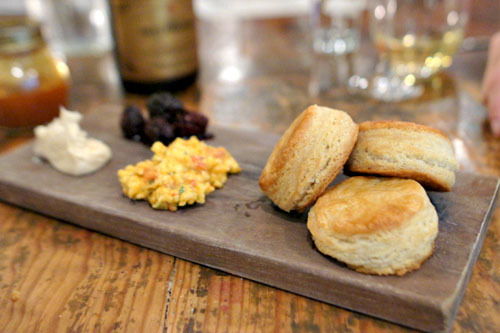 And here we come to HatH's much bandied about biscuits, served tonight with a delightfully sweet cinnamon butter, juicy blackberries, and a wonderfully creamy-spicy pimento cheese. They're probably worth the hype, and likely the best versions that I've ever had: crisp out the outside (with a nice "crust"), yet soft and fluffy within, and super, duper flaky. How flaky? They literally fell apart when I picked 'em up. Yeah, you gotta order these. 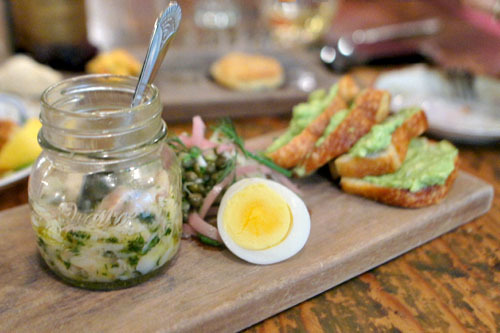 A jar held the smoky, fishy, oily essence of trout, its palpable heft fortunately moderated by the mound of crisp pickles nearby. The egg was certainly tasty, though a touch superfluous, while the avocado toast served as a subdued base to the dish. 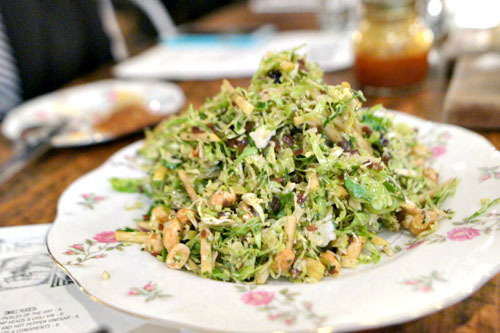 Our salad arrived looking more like a slaw, with the salty weight of the cheddar taking center stage against the wonderful crunch of the peanuts, while the vinaigrette tied things together with a sweet, tartish verve. There was only one problem: the bitterness, the crunch, what I love about Brussels--it was all a bit overshadowed, set in the background. To make good use of the BYO policy, I brought along three beers that I'd pulled from my fridge, all Americans in keeping with the restaurant's theme. 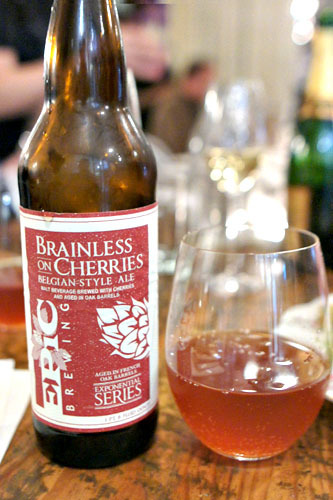 The first was the Epic Brewing Brainless On Cherries from Utah, one of only 1,800 numbered bottles from releases #13. It was a beautifully ruby-tinged Belgian-style ale, brewed with cherries and aged in French oak red wine barrels. I found it surprisingly light and thin, with a pretty restrained expression of the fruit and less sourness than I was expecting. 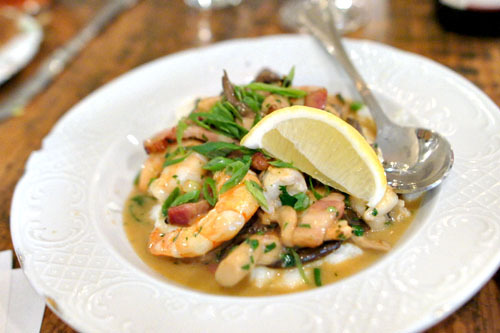 A staple of Charleston and its surroundings, the shrimp 'n' grits is a relatively new item on the menu, and is a surefire winner. The shrimp were cooked spot on, with a great bite to them to go along with their subtle, saline sweetness. The grits, meanwhile, were even better, creamy and satisfying, with a fantastic hit of salt from the bacon, all while the mushrooms added an earthy veil to the dish that worked flawlessly with both elements. An absolute must-try. 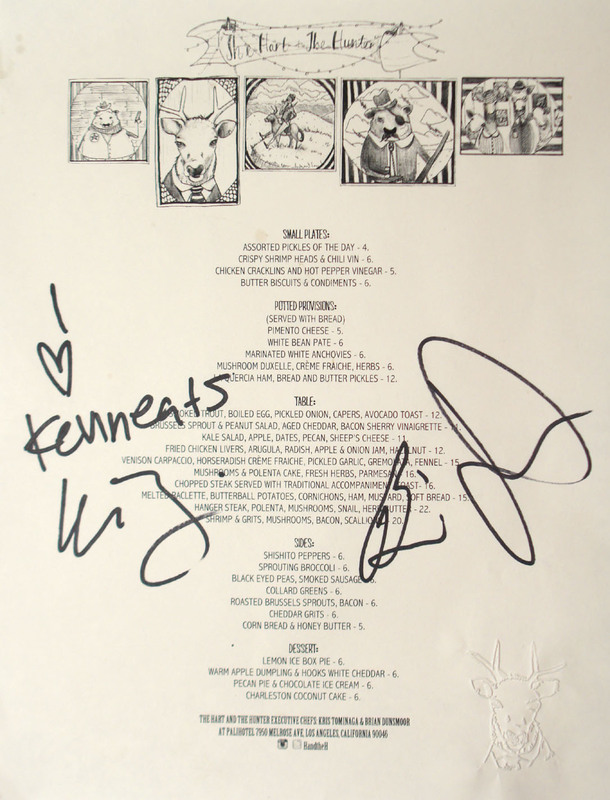 Ironically, the only dish on the menu featuring hart (deer) was the least successful. The meat was actually a bit lost amongst the other ingredients in the dish, the gremolata and crème fraîche in particular, though I did appreciate the salty kick of the cheese here, as well as the lightness of the fennel strands. Up next was a classic preparation of shishitos, the char on the peppers working beautifully along with their sweet spice. Everyone knows that about 1 in 10 shishitos are super hot, so I must've had some back luck tonight, as I kept getting a string of the spicy ones. Yet, I kept going--pleasure and pain I suppose. 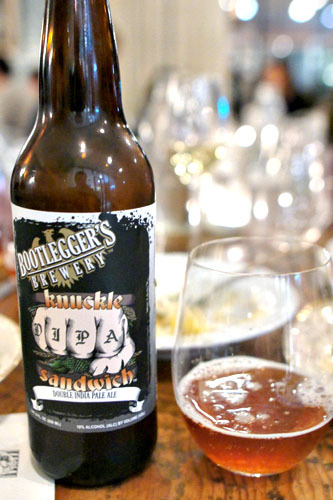 To pair with our heartier courses, I brought out the Bootlegger's Brewery Knuckle Sandwich, a limited release double IPA brewed right here in Fullerton. It was a superb example of the style, with a great malty base intermingled with the requisite citric and floral nuances. Supremely balanced between bitter and fruity flavors. 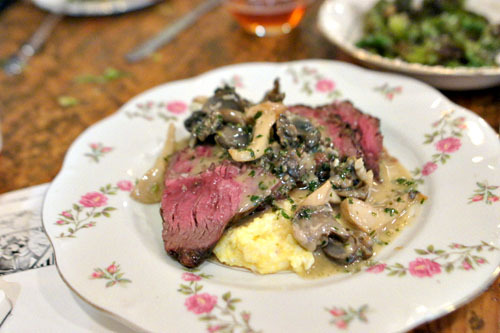 A hanger steak was nice--tender and flavorful--but it sort of took a back seat to the snails. Indeed, the escargots had a lovely texture to them, and showed off a mouth-watering saltiness and savor amplified by the mushrooms and butter. Tasty, but domineering, though fortunately, the polenta here did help balance things out. What I felt was lacking in the salad above I found right here in this plate. 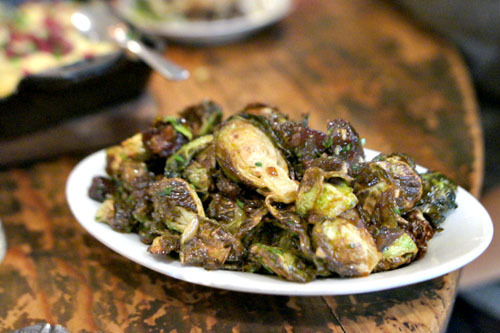 The bitterness of the sprouts was proudly displayed here, deftly paired with a whisper of char astringency, a touch of sweetness, and the salty punch of bacon. 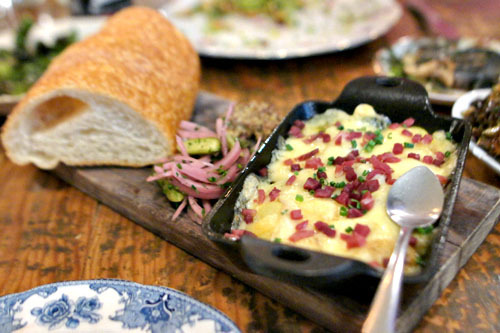 Our last savory dish, a reimagined version of the Swiss raclette, featured the always-winning combination of cheese and potato. Indeed, the age-old pairing made perfect sense, forming a hearty, homey, comforting mélange of tastes and textures, perfectly perked up by a hit of salty ham. At the same time, the traditional accoutrements of pickles imparted a sense of moderation to the course, and the bread was a natural pairing, too. 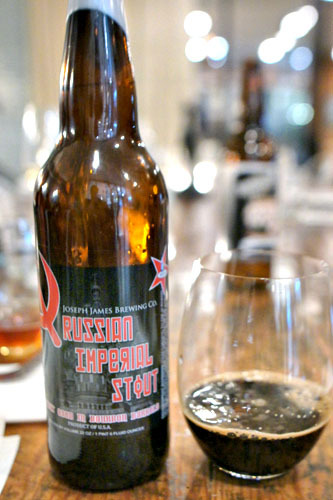 To go along with dessert, I paired a hand-numbered (#435) bottle of Joseph James Brewing Bourbon Barrel Russian Imperial Stout, a version of the brewery's standard Red Fox RIS that's aged for seven months in (Four Roses?) Bourbon barrels. Dark as night, unquestionably viscous, and smooth, the beer was loaded with notes of chocolate and coffee on the nose and the palate, with a marked sweetness all commixed with an undercurrent of oaky goodness from the barrel aging. Nice! Time for some desserts, which are handled here by Pastry Chef Sarah "Bearclaw" Schreck. We began with the ice box pie, a Southern treat that's quickly becoming H&H's signature dessert. 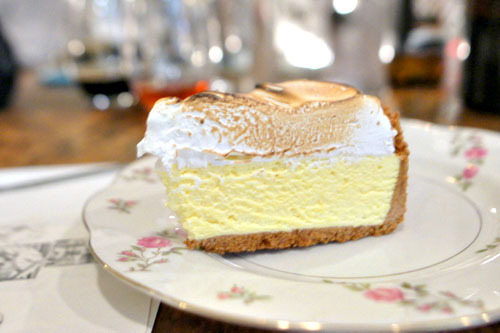 The custard here was fabulous, with a dense, frozen-ish consistency and a boatload of puckering, lemony sourness balanced by the sugary meringue, all while the graham cracker crust served as a flawless complement. We ended our night with easily the best coconut cake I've ever eaten, and one of the most delicious cakes I've had, period. 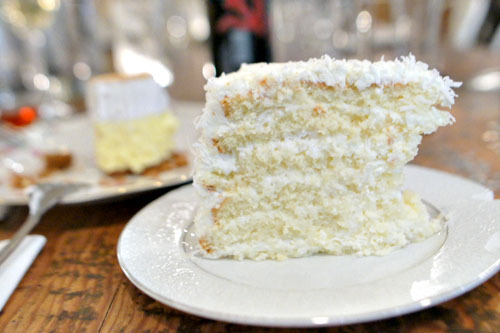 Possibly inspired by the "ultimate" version at Peninsula Grill, it conveyed a gorgeous coconut sweetness within 10 layers of moist, sponge-y, saturated goodness, topped off by a delightful toasted coconut character. It was almost tres leches-like in nature. Perfect. 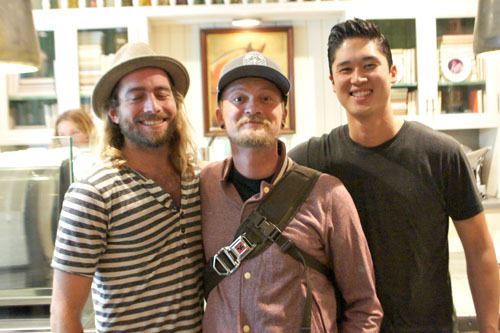 The Hart and the Hunter Manager Jonathan Strader, along with Co-Executive Chefs Brian Dunsmoor and Kris Tominaga. 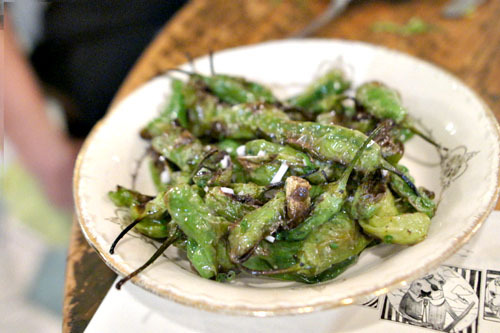 Before opening Hart and the Hunter, Dunsmoor and Tominaga embarked on a culinary tour of the South, and perhaps because of this, the cooking seemed slightly tweaked from before. Indeed, they're still intermingling the traditions of American Southern cooking with Cal cuisine sensibilities, but the dishes seemed a bit cleaner, more focused, with a clearer Down South aesthetic. I'm glad that the two have emerged from the WiSC debacle as strong as ever, and finally found a place to call their own. "but the dishes seemed a bit cleaner, more focused, with a clearer Down South aesthetic"
Glad you liked the desserts!